-Human Resources Development Project for Community Disaster Preparedness in India Launched! -SMILE by WATER Project 2016 Completed! -The 4th Kyoto World Water Grand Prize: Project completed! In early November, I traveled to Nagoya by bullet train. When we were passing through a tunnel near Atami, there was an announcement: “You can see Mt. Fuji on your right”. Soon I saw beautiful Mt. Fuji standing out against the colorful autumn leaves under a splendid sky. The sight overwhelmed me. While looking at the lofty mountain rising into the sky, I was reminded of my weakness as a Japanese. We are proud of Mt. Fuji as a symbol of Japan. It is our highest mountain; no other mountain can compete with it in beauty. In winter, the splendor of the snow-covered Mount Fuji is breathtaking. It is certainly the greatest mountain in Japan in both height and beauty. Most Japanese people, including me, are aware that this overwhelmingly impressive mountain exerts a great psychological impact on us. Or rather I should say that we are overly influenced by Mt. Fuji. Japanese people tend to like climbing Mt. Fuji to their way of life. When we climb the mountain, we go up the slope step by step intently, counting on our physical strength. We stay overnight at a lodge near the top of the mountain. Then, early next morning while it is still dark, we start for the top of the mountain. At the top of Mt. Fuji, we wait for the sun to rise over the horizon, and pray with our hands pressed together to the rising sun for our good health and happiness. This ritual at the top of Mt. 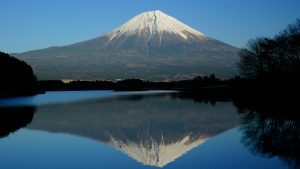 Fuji is the final goal of climbing the mountain. When the ceremony is over, we begin to descend the mountain homeward. Our purpose is only to reach the top. We take this for granted. However, I have learned that there is an entirely different way of thinking about mountain climbing from a man named Peter Frankl. He says that the whole process of climbing and descending a mountain has great meaning for us. Peter Frankl is a famous Jewish-French mathematician living in Japan. He looks at Japanese people and society objectively and expresses his opinions clearly. One day, I was discussing Japan’s population problems with a journalist friend. 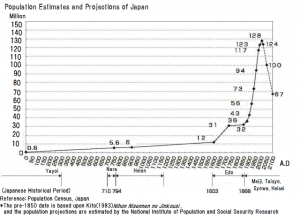 The demographic trend is an indicator we can use to describe the Japanese nation. In a sense, the Japanese nation may currently be at the top of a mountain. We are standing on the top of the demographic trend, having attained our goal of an abundant life. Though we have reached the pinnacle of development, no one knows where to go from here. Throughout Japan everyone is bemused by this question. When the Jewish people reach the top of a mountain, they soon head for the next summit. Therefore, they first go back down the mountain. Their purpose is not to reach the top of the mountain. Descending the mountain in order to climb the next summit is also an important process towards the goal. When my friend interviewed Peter Frankl, he compared the way of thinking of Jewish people to mountain climbing. Figure 3 shows steep mountain ranges seen from Mt. 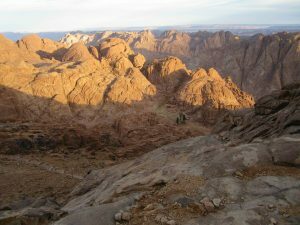 Sinai in Egypt. Mists that had obscured the truth for so long suddenly cleared when my friend described Mr. Frankl’s views. The important thing is not just to climb a mountain, but to descend as well. In order to head for the next one, we must first go down. Standing on the top of a mountain is not the final goal. There are many mountain ranges before us. Life is like climbing and descending mountains one after another. This is also true of the way humankind created civilization. There are many mountain ranges in front of us. All of them are global challenges. One of them is the tight supply of fossil-fuel energy. Second is shortages of food and water resources. A third is environmental degradation. The last and the most difficult one is climate change. Mankind must overcome these challenges. Japanese people should not be satisfied at the top of Mt. Fuji, feeling that our mountain-climbing is over. We need to descend the mountain and set off for the summit of the next mountain. The Japanese population has reached its peak today. It will certainly decrease. We need not to be afraid of a decrease in population. This is the preparatory process for the Japanese nation to head for the summit of the next steep mountain. I have previously insisted that the character and history of a nation are defined by topography and climate. But I was not aware that I had been emotionally constrained for a long time by Mt. Fuji. Mr. Frankl’s view made me aware of this. The purpose of an individual and society is not to stand on the top of Mt. Fuji. The purpose of our lives is to fight against the endless challenges before us and try to overcome them. The process itself defines our life and nation. SMILE by WATER Project 2016 Completed! In response to Sustainable Development Goals (SDGs) adopted in September 2015 at United Nations Headquarters, Junior Chamber International (JCI) Japan has launched “SMILE by WATER Campaign” and decided to deploy a movement with aiming to achieve “Goal 6: Ensure access to water and sanitation for all”. In the first year of the campaign, JCI Japan has carried out “SMILE by WATER Project 2016” in collaboration with Japan Water Forum aiming at ensuring safe drinking water in rural communities of Bangladesh. The 4th Kyoto World Water Grand Prize: Project completed! Kyoto World Water Grand Prize aims to praise organization involved in grassroots activities dealing with water problems, which may serve as a model for others. The prize has been held since 2003 with the World Water Forum which is the international conference held once every three years. Upon calling for nomination, 110 organizations from 37 countries which aim at solving water-related problems at grassroots level applied for the prize. After careful consideration, Environment and Public Health Organization (ENPHO) in Nepal was selected as a grand prize winner. Eighth Meeting of High-level Experts and Leaders Panel on Water and Disasters (HELP) was held on Tuesday, 1 November 2016 in Jakarta, Republic of Indonesia. After dynamic paradigm shift of the international framework as well as Japan’s framework of water-related issues such as the new beginning of the Sustainable Development Goals (SDGs), the adoption of the Paris agreement, the latest and historic agreement on the climate change, the adoption of the post-2015 framework for disaster risk reduction, the Sendai Framework and Water Cycle Policy approved by the Japanese cabinet. HELP encourages cooperative actions on reducing water-related disasters by nations and international organizations.